How to use YouTube Night Mode/Dark Theme on Android? Hello, The Guru is here with yet another awesome hack to make your life easy. Your smartphone has so many apps installed already like Instagram, FaceBook and one of those apps is YouTube. Do you know YouTube has two modes of operation? in this article we are going to Look for the Darker side of YouTube, Just kidding!!. I am talking about YouTube Dark Theme or YouTube night mode . 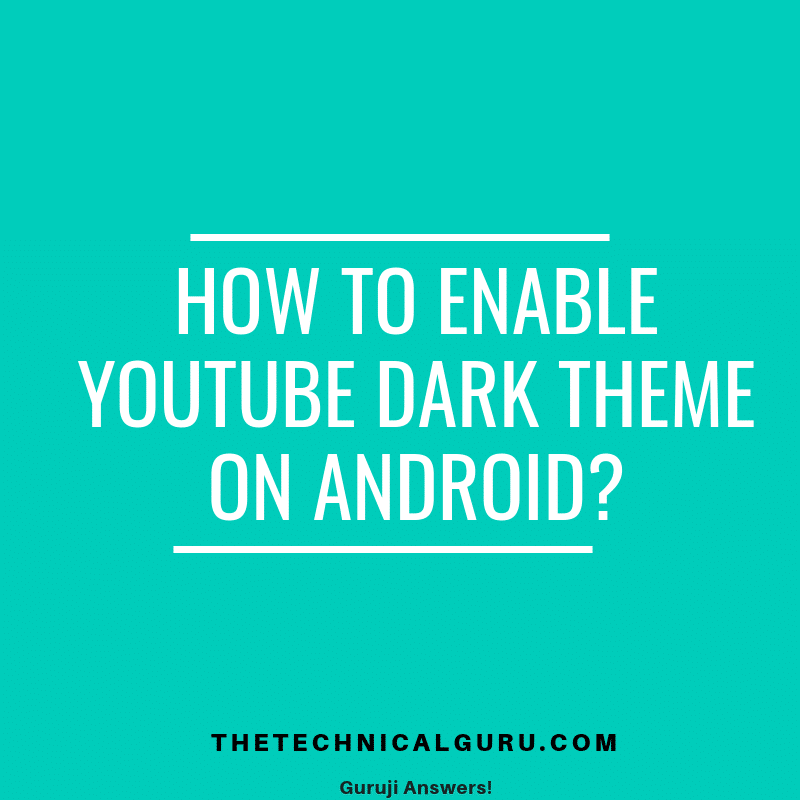 Here you will learn how to use YouTube night mode or Dark theme on Android? There are so many aspects that make an app really beautiful and satisfy user while using it. Beauty being the top aspect and all app developers try to deliver their apps in a most aesthetic manner. YouTube app is no exception for this. YouTube has managed to provide two beautiful theme options for their users. One is the regular white color theme and Another one is youtube dark theme for Android or ios. You must be wondering why I should go for the dark theme on android for YouTube. There could be so many possible Reasons. One being you like black color and the other is you are a fan of Dark. Apart from these, there are some advantages of having a black screen too. I personally feel it more cool. My eyes feel much more at ease compared to the white background scene. But whatever could be your reason there is this youtube night mode android theme is worth trying. Now you must be thinking that its okay. I can understand the Black theme or Dark theme but how can we use this theme on Android mobile. So let’s start quickly. Step3: you’ll find the toggle button for the dark theme. Step4: Enable it. You have successfully activated the YouTube Black Screen. Look i simple it was to update your Youtube app to New Black theme for YouTube. This youtube dark theme was made available for selected users. if you are not able to see the Dark theme option then you might be missing this update. There are several useful updates rolled out for the YouTube one of that impressed me is a reminder for the user to Take a braeak while using the App. I think this is very useful feature along with youtube dark theme android. So we hope you really find a way to switch to the YouTube Black Theme. or some may call it as the YouTube Dark Theme more for android. This was it for this article about YouTube Black Theme (Night Mode). Some users also want the youtube dark mode android apk. But we dont think you need to Install app using apk and then enable this youtube night mode android. So instead of using the youtube dark mode android apk just download the app from google play. Follow the Procedure. Thanks for Reading.